As part of our treatment options, Hill Crest Dental Centre provides tooth-coloured fillings. 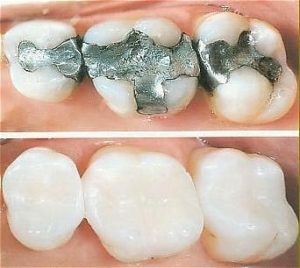 You no longer need to worry about having metal fillings visible in your smile. The current tooth-coloured fillings are not only strong and durable, they blend in and keep your smile looking natural. These fillings can be used in place of traditional metal fillings to treat tooth decay or injury and even replace older metal fillings. The fillings restore teeth to their original strength and function, and help protect them from further damage or decay. If you have larger areas of decay, it may be necessary to go one step further and use a porcelain inlay, onlay or a crown.